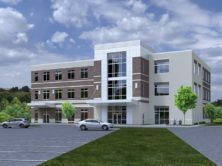 Edifice is teaming with Davis Stokes Collaborative, Community Health System and Nest Homes to design and build a new three-story, 31,000sf Ambulatory Surgery Center and Medical Office Building. The new building will support a new operating suite with provisions for a future second suite on the first floor. Doctors offices, conference space, and retail space supporting the ASC will be located on the upper two floors.